Meatballs aren't something I typically make for dinner. In fact, they aren't something I ever order when I go to dinner either. I like them, I just have never given them much thought, until now. I had some time on my hands one Sunday and decided to get in the kitchen and make a few meals to get us through the work week. Nothing is more frustrating than coming home from the gym in the evenings, and having to prepare dinner when I'm starving. My intention that particular Sunday afternoon was to cook something that would still be good leftover and also satisfy my husband's bottomless pit. These meatballs seemed like the perfect fit. They were a little sticky when I first started working with them, but they turned out great. The key to the added flavor is browning them all on sides, before you finish them in the oven. This was such a good meal. I didn't feel bad about eating either because veggies were involved. It's also a good option if you are trying to cut back on carbs- that is if you can refrain from sopping the sauce up with bread. 1. Pre-heat the oven on bake at 400 . 2. Place the ground chicken in a mixing bowl and add the thawed spinach, egg, diced onion, whole wheat bread crumbs, Parmesan cheese, garlic, salt and pepper to taste, and mix well. 3. Roll into individual large meatballs. I was able to get 15 out of this recipe. 4. Place the meatballs in a large skillet coated with olive oil, on medium heat. 5. Turn them over as they cook so most of the meat has browned all around, not fully cooking them through. 6. In a large skillet or braiser, pour the marinara sauce in the bottom of the pan. 7. Remove the meatballs from the stove and place in the skillet filled with sauce. 8. 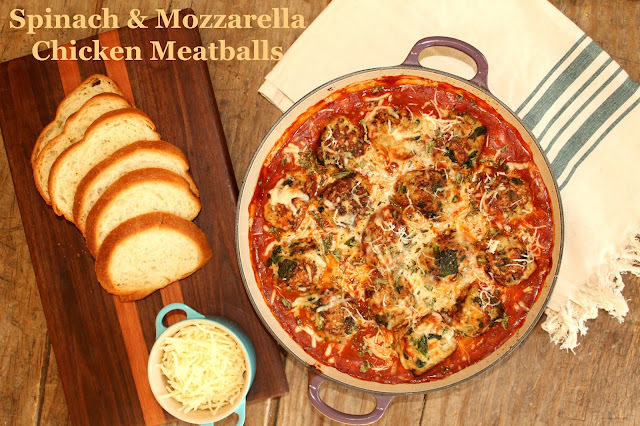 Top with mozzarella cheese and bake for 20 minutes or until meatballs are fully cooked through. 9. Remove from the oven and top with crushed basil and extra cheese. the last picture...oh man. i want it. Thanks! Super easy and delicious! These look great! I made something similar with a Blue Apron meal a couple weeks ago and it was delicious. Especially for this cold weather! Thanks! Blue Apron has some great sounding recipes. I've never tried them before but I get the emails with the recipes and everything always looks so good.